The G in LG new LMG860 series stands for Google, more specifically it indicates that alongside the Smart TV feature found in other LG televisions the new LMG models also add the functionality of Google TV and it's search, web browsing and other features. The LMG860 has a Standard picture setting option that competes very well with the best picture settings we can come up with even after calibration with our professional equipment, CalPro software and the easily accessible 10 point white balance control on this TV.. While the other settings were off in one way or another, the standard setting retains a realistic color balance that is very pleasing to the eye. Since edges are very soft on this TV, we are not as concerned with decreases the Sharpness setting which controls edge enhancement. LG's 3D Cinema picture is passive, meaning the glasses are not powered and instead the 3D images are generated by the stereoscopic images on the screen. The LG 55LMG860 does have great color renditions. It's natural and saturated at the same time – a nice combination. However, dont be mislead by the companies claim that "In 3D tests, 4 out of 5 people choose LG Cinema 3D over Samsung and Sony for best color." Color is only one part of the total 3D picture. Image depth, crisp, clean edges, brightness and contrast all combine with color to determine the quality of the 3D picture. LG leaves out these other aspects. Overall, 3D picture quality on this TV evens out at about average. This is a faster Hz rate used in the 55LMG860 to attempt to eliminate motion artifacts caused by fast moving objects across the screen. It increases the normal 60Hz rate to 240Hz. We see the jump to 120Hz as the most significant, but the worth of this feature really depends on how the TV processes the signal when using it. The LG 55LMG860 has the same new look as the models that aren't Google TV enabled. The ultra slim 5mm bezel might as well not even be there giving the television a smooth, single pane of glass look that is among our favorite looks for modern televisions. The LMG860 series will impress friends and family even when it isn't turned on. The Google TV dashboard on the LG 55LMG860. Google TV is included along with the normal Smart TV suite. 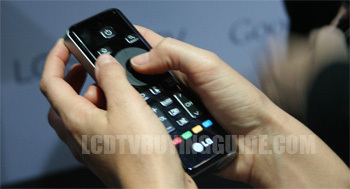 The LG 55LMG860 also contains the new Google TV options in addition to the normal LG Smart TV options. This allows access to the Android TV Apps marketplace as well as all the services that are available there. Navigation can either be accomplished by LG's dashboard or through a special Magic Remote (even more special than the normal Magic Remote) that has a QWERTY enabled feature added. With the addition of Google TV the LMG860 gets a special Magic Wand remote that includes the motion sensitivity of the normal Magic Remote but also adds a full QWERTY keyboard to ease typing in Google TV's search feature and web browser. With the addition of a full keyboard the remote is naturally bulkier but being able to type quickly is a good trade off when interacting with Google TV's numerous functions. 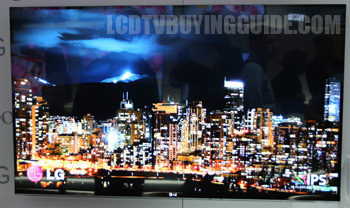 The LM8G60 works with LG's new Dual Play system. With Dual Play 2 gamers playing on the same TV are no longer forced to suffer split screen. Looking at only half the screen and possibly even having the picture cut can ruin the experience in many games and Dual Play cures it. Using the Cinema 3D system both players games are projected onto the full screen at the same time and each player wears a different pair of polarized glasses so they only see their own game on the full TV screen.